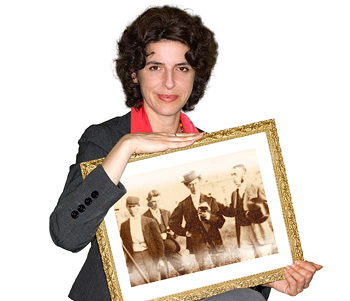 Above and at right: Delphine Gourdon, assistant professor of materials science and engineering and a recent faculty hire, holds up a detail of an 1870 photo showing Cornell civil engineering faculty and students mapping the hill now known as Libe Slope. 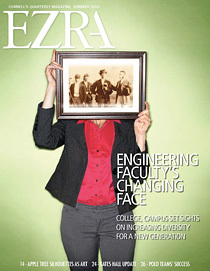 Magazine cover photo (above left): Photo by Robert Barker/University Photography; digital postproduction by Matthew Fondeur/University Photography. Surveying upper Libe Slope image: Courtesy of the Division of Rare and Manuscript Collections, Cornell University Library.